Return pump: Panworld 100px. Approx. 600gph of flow. Purchased in Sept 2012 and has been low maitenence. They are not 100% true external becuase the impeller has a magnet that is in contact with the water. It does add a little heat to the system but very little compared to a submersable pump. Pump is hooked to a triplite 750w UPS. 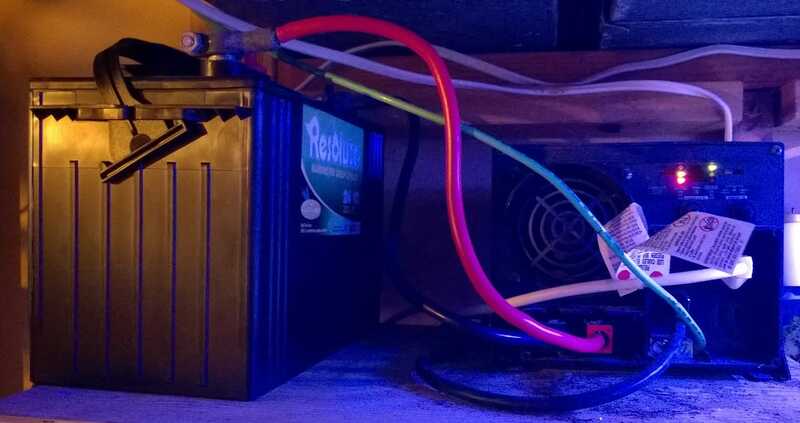 I use a deep cell marine battery from Fleet Farm ( costs about $85 ) that has a reserve capacity rating of 175. Wattage used by the return pump is 125w and will run approx 6.5 hours on the UPS. This usually is sufficient for more power outages and gives time to hook up generator for any longer outages. 8:30am to midnight using the Ricon setting. Both ramp to max setting of 85%. Previously had been using Maxijet with sureflow mods for many years. 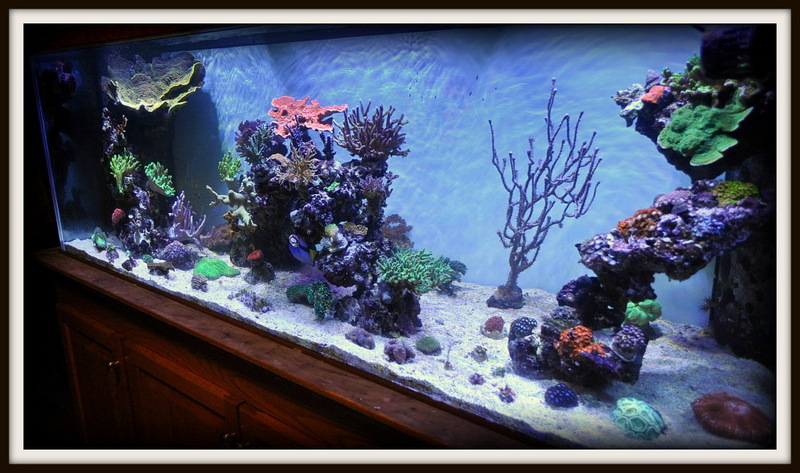 Linear Flow: I have been using this method for in-tank circulation ever since my 375g tank back in 2003. I now use Apex Wav pumps but I still prefer linear flow. With the Wav pumps the intensity can vary whereas when just using Maxijets it was only on/off. However the effect is essentially the same and have not seen any noticable benefit from using the variable speed pumps. 12am - 8am: Left Side Only. 8am - 4pm: Both Sides. When Left or Right Side only periods, the flow goes in a circular motion. The flow from the pump goes across the upper zone of the tank, hits the side wall and the lower portion of the tank flows back towards the pump. Pumps flow varies throughout using the Ricon setting on the Apex and will run up to 85% power. Since all corals are getting equal amounts of flow from both directions in a 24hour period, Hard corals tend to grow more symetrical.Gorgonians also love this type of flow.Wit a more popular type flow which uses controllable powerheads that ramp up and down flow but never off, corals that are located closer to one pump tend to get more flow from one direction based on proximity to the pumps. Overtime the corals can grow into a leaning tower type pattern. Left Side Only Pump on. Creates a Linear flow with an undertow back to the pump. Left and Right pumps on creating a more chaotic flow. Right Side Only Pump On. Creates a linear flow.